Commercial grade wall mounted shower panel. Elegant acrylic body, chrome plated moldings and decals. It creates a gentle or vigorous massage for the whole body. A flow of water through multiple showerheads/ water injectors creates different effects. High water pressure stimulates blood circulation while medium water pressure creates state of relaxation. This type of hydrotherapy is very beneficial for overstressed people and provides relief from symptoms of tension, insomnia and stress. 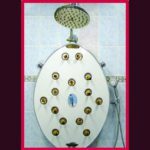 PES-15 shower panel treatment is a perfect complement to many spa packages. 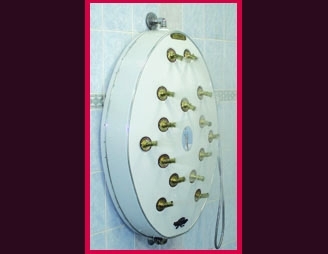 PES-15 DS Double Shower panel is equipped with elegant oval acrylic body with 15 shower heads/ water injectors and hand shower with individual shut-off valve. 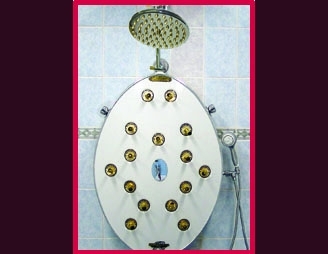 PES-15-TS Triple shower panel is equipped with elegant oval acrylic body with 15 shower heads/ water injectors, hand shower with individual shut-off valve and head rain shower with individual shut-off valve.